This model also better explains edge cases that are difficult for Kahan’s model. For instance the minority of higher educated Democrats and Republicans (to a lesser extent this occurs for the science aware too) who are opposite to their respective party trends. While I guess this is not impossible to address within Kahan’s framework, it’s certainly a serious challenge to provide a robust and generic explanation, given that their political allegiance pulls in the opposite direction to their views about dangerous MMGW. Yet climate culture is a strong independent influence that in some folks will overwhelm any political stance; and likewise some who resist this strong culture can come from the political left as well as the right. The view that Kahan and many others hold regarding attitudes to climate change in the US tends to boil everything down to a left / right tribal political influence, and this view masks what’s really going on. For instance that there are far more Democrats (‘the shifters’ above) who don’t believe the orthodox narrative of dangerous MMGW, than do. They are merely allied to this narrative for the sake of their identity and party, yet never place climate policies high on the agenda. In some surveys these shifters outnumber the full climate culture adherents who are also Democrats, by almost 2 to 1. Kahan’s model is also challenged in countries outside the US where climate change has not become so mixed up with political identity. For example the UK, where all the main parties support policies to fight man-made climate change, yet nationally there is still significant skepticism. In the diagram above this is represented by shallower left-right lines, yet still a significant block at the bottom of the graph. In other words, the adherents climate culture has claimed are more evenly spread across the political spectrum than is the case for the US, as are those that resist the culture too. This is clearly a problem for a model that doesn’t acknowledge a climate culture in the first place, and essentially places ‘disbelief’ only at the door of right-wing identity defense; it doesn’t seem plausible that fundamentally different mechanisms are driving attitudes to climate change in the US than in the UK (or elsewhere). The attitudes of non-partisan Americans shed light on an issue that is often perceived as chiefly partisan on the left / right political axis. Especially the subtle yet significant attitude shift for the higher educated Independents. These support the case that the true situation is more complex, and that a third cultural pole is involved. If ‘knowing disbelief’ is why many millions of science aware Rep/Cons resist the narrative of dangerous MMGW much more even than Rep/Cons generally, a theory founded on a subconscious apprehension of danger plus potent identity defense of right-wing politics / principles, then apparently about half of higher educated Independents must suffer from this very same problem too. This is despite these least partisan of US voters not actually having a Rep/Con identity to defend in the first place. ‘Knowing disbelief’ is not a plausible explanation. Caveats: One small survey doesn’t make a summer, and these are rough and ready figures to get an idea of what’s going on. Plus a difference effect between two populations of Independents is bound to be modest; it seems not much more than twice the natural slop in the figures (all Independent cells are at most 3 points from the Rep/Dem average bar the middle left, which seems a slightly high outlier). Nevertheless, this survey shows with relative confidence what is very unlikely to be going on. As noted in section 4 the Independents’ responses would have to be very different indeed to match Kahan’s model. A high quality survey of the science aware / climate science aware Independents would be of great value in exploring this angle further. The belief nature of dangerous man-made global warming puts it in the same camp as religion as I’m sure you suspect but are careful not to write. As such, a few pioneers, trend setters or truth-bearers will exist followed by others who believe on their words. While it is obvious that believers exist, an exploration of why believers exist and whether choosing to believe exists versus manipulated belief. For example, the Scientologists practiced “love bombing” and by association a person believes that the attention he is getting emanates from Scientology itself. Faster results are obtained by invoking fear (FUD, Fear Uncertainty and Doubt) but it has a half-life of just a few years. The half-life of any belief that is not routinely refreshed seems to be about 10 years. One of these days I may go into more detail; I vaguely recall that from CIA brainwashing experiments that turned out not to be sufficiently permanent. Concepts such as “critical mass” will also pertain; if enough people believe a thing it will form a “bubble” of belief that is self-sustaining. Another way of looking at it is dominoes; if they are stood up with proper spacing they become a critical mass; knock one over and they’ll all go. But if spaced out, the collapse does not travel through the entire world of dominoes. So an idea or meme will travel rapidly through society if society expects that particular meme and if it is important in some way. It is to a certain extent also geographic; large areas of the nation could simply not be at critical mass and the meme vanishes within that region. As with any natural bacteria or virus, people have low immunity to pathogens they’ve never seen before and high resistance to familiar pathogens. In the 1990’s, predictions about the end of the world were commonplace and somewhat immunized society to doom predictions. I suspect that is why the vulnerable-to-suggestion population tends to be young. They don’t remember the street preacher doom-sayers. Not unreasonable logic, and extra humor from the mimicry is a nice twist too. However, your mirror could be improved. A proper religious salvation substitute would have a powerful emotive connection to actually saving folks (or at least saving an anthropomorphized entity, like the planet as ‘Gaia’). So for instance ‘saving lives by lifting folks out of fuel poverty’ would be a much more appropriate text for your version that has more emotive bite, rather than just some general reference to poverty. And you’d have to come up with something much better than ‘but a con’. However, even reasonable logic may slip if starved of information. For instance, even in a small (and wealthy / developed) nation like the UK, there are typically many thousands of excess deaths due to cold every winter, caused by fuel poverty. Even the relatively mild year of 2013/14 produced over 18,000 excess deaths. In the harsh 2012/13 winter, it was over 31,000. These are real recorded deaths in government figures, and will obviously be much higher for all the high latitude countries together. While policies to fight climate change are by no means exclusively responsible, commentors and experts on all sides acknowledge this is a very significant factor contributing to higher fuel prices, becoming more so in recent years (albeit not identical per country) plus projected to increase energy bills still further in coming years. Other global issues such as the upward pressure on food prices due to the bio-fuel debacle likewise have deleterious effects, but as this is mostly outside of developed nations (so poor data) and much less easy to disentangle from other causes, we could simply rule this out for now and stick to the hard figures alone. Even so, the obvious problem with citing this whole area (which per your wording does fall under ‘poverty’) as an arbitrary salvation substitute meme, is that the emotive content is largely backed by veracity. Arbitrary memes are those where, largely, the emotive content is not back by veracity. To date there are no attributed deaths of grandchildren per the strong CAGW salvation meme noted up thread. Many grandchildren have birthed in the 25/30 years since the topic of climate change made it onto the world stage. While attribution science is in its infancy and one might claim that if it were much better, linkage to deaths may appear, or at least a high confidence of such, a serious blow to this narrative is that for any grandchildren reaching adulthood (say 18 years) around now, there hasn’t in any case even been any significant warming in their lifetime. Apart from the two direct effects (Sea PH and CO2 fertilization), which on a longer timescale may have mixed benefits and harms via impact upon the food-chain, ALL the supposed ACO2 calamities are posited on temperature rise, so cannot have harmed any of these grandchildren. Hence we are not talking about current grandchildren, but future ones, and per the emotional outpourings of climate scientists themselves (here, here and here), apparently grandchildren in affluent western countries too (where various societal buffers against severe weather effects are very much higher). This comes down to the speculative addition of pure emotion to try and reinforce an original argument of imminent (decades) climate calamity, which does not have enough science or certainty to support it at all (regardless of whether or not it might have one day). Hence it’s an arbitrary meme, a true salvation substitute. . There are most certainly arbitrary memes in skepticism. ‘Hoax’ and ‘Conspiracy’ narratives are examples. 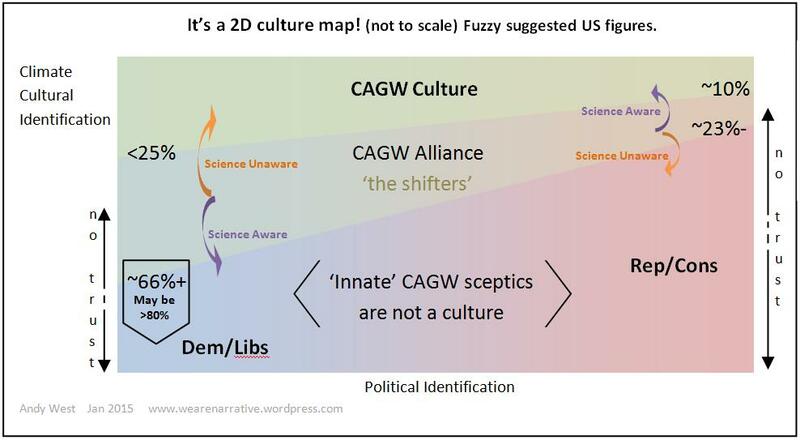 While any large human enterprise will spawn some cons and other parasitical effects on the side, these are *not* the primary drivers of CAGW, so those narratives are inappropriate. (And perhaps your own label of a con is similarly inappropriate, though ‘poverty’ covers such a huge territory most of which pre-existed long before CAGW, it’s not certain how much of that you want to claim that skeptics are inventing. As noted, fuel poverty in developed nations is much easier to isolate than the many tangles in undeveloped nations). However, merely plural memes do not make a memeplex. In both emotive punch and sheer volume, orthodox memes massively outgun skeptic ones, and they are co-evolving in a coherent manner to produce an enforced consensus and the various social attitudes (as shown in other posts here) which reveal a cultural entity. This is not so for skepticism (and indeed a common complaint in some skeptic forums is that they can’t agree on anything, which [I paraphrase] weakens their opposition to the orthodox climate position). There is no mirror; the situation is highly asymmetric. In the end the only thing that links all the tremendously diverse skeptic viewpoints is the realization that there is not scientific backing for a *certainty* of calamity. I suspect more than a few in scientific circles who are theoretically orthodox now realize this too, yet daren’t speak out. The cornerstone to the CSD belief structure is encapsulated in “there hasn’t in any case even been any significant warming in their lifetime” . To my observations this is a demonstrably false belief. I have debated this extensively on various forums using the information put forward by the oponent and the result is always the same. There was a reduction in the rate of temperature rise for a step period, as has happened twice before, and temperature rise has continued in concert with atmospheric moisture and atmospheric circulation energy. It is not just about static air temperature. Temperature rise seems now to have resumed the higher rate of temperature increase. The mirror was to demonstrate that the CSD position is predominately about the very tribal culture that CSD’s are attempting to paint “warmists” with. This type of argument is becoming known as the netball defence after Australia’s idiot prime minister declared himself to to be a “netball Prime Minister”, a remark that was quickly aligned to his standard method of debate being to stand as near to the opponent as possible, yelling (anything at all) and waving arms furiously in order to distract from what is really going on (this being the only tactic this objectionable person knows together with his blatant dishonesty). The poverty reference was to the coal industry’s latest claim that coal can lift the world’s poor out of their desperate state by giving them electricity. The obvious retort is that 120 years of grid electricity has failed to achieve this, so why now? why should it magically start to happen now? When the reality is that it is magically happening, but from solar power with the energies of organisations such as the “barefoot college”. The fact is that any African nation prepared to spend a billion dollars on a coal power station would achieve more by providing solar panels, a battery and some led lights to the poor and dispersed. Gotta go and work. Well I generally observe the average of the 5 main temperature series products, which do indeed indicate that “there hasn’t in any case even been any significant warming in their lifetime”. You can coveniently see all of these series on one graph at http://www.climate4you.com . While the arguments over minor temperature wiggles and what they may mean is labyrinthine, just from eyeball you can see that the average rise over last 18 years is naff all, about 0.1C, with the sattellite series about flat and the highest surface series, GISS, a little over 0.2C in that time. Given we can’t know which is ‘true’, an average seems perfectly reasonable. No-one anwhere in the debate thinks 0.1C on its own is harmful or even significant in respect of danger. Of course that figure speaks not at all to what will happen from now, or indeed what happened before 18 years ago. The narrative of Global Warming ultimately relies on all the various factors in play (a couple of which you note) *one day* expressing themselves sufficiently in GST that there *will be* a problem, where we start the cumulative GST ‘clock’ at about 1950 according to the IPCC. Or put the other way around, if the GST remained precisely the same after say a century, no matter what was happening wrt all the other factors, it would be very difficult to see how any real dangers could manifest. ‘Sufficiently’ is another argument of course, and what type of ‘problem’ too; for instance life on Earth has been very happy in the past at temperatures very much higher indeed than now, but that doesn’t mean for instance our coastal cities would be safe. OTOH, coastlines are not very different to the also warmer-than-now (according to proxies that of course are interpretable) Minoan and Roman warm periods. Incidentally, over at climate4you you can also see the effect of the new and controversial Karl et al adjustments on GST. Look at the red and blue lines in the NCDC graph. Interestingly, the adjustments create a small gradient during the hiatus, but actually *lower* the gradient overall. As NCDC goes into other surface products including GISS, that’s in part how GISS achieves its 0.2C. Tribal insults or denigration (as opposed to honest bias simply by virtue of loyalty to a particular group) is bad in the CC debate or any other. Sadly, some folks on both sides in CC weaken to this. While we’re on that topic, I don’t appreciate you labelling this site as ‘guiled’ over at John Quiggins. Dictionary.com gives guile as ‘insidious cunning in attaining a goal; crafty or artful deception; duplicity.’ There is none of that here. I have dealt with you and everyone else straight. My position (which happens to be almost exclusively about the social / pyschology side, I don’t pursue stuff about the climate system itself) is wholly honest and fully supported by public posts (published more widely than here). These posts in turn call up public surveys and a whole raft of papers and references, most of which are from solidly Consensus sources (because with these there’s no chance of folks claiming such papers / references may have skeptic bias). You don’t like these arguments? Well challenge them then, and not my character. I’d appreciate it if you’d correct that comment and remove ‘guiled’. Most certainly 120 years of electricity hasn’t cured poverty. But this speaks nothing at all as to where we stand now, or whether it can or can’t from this point on. The historic reasons why are many and various, e.g. the simple cultural and economic inertia of civilizations many centuries (sometimes millennia) behind the West (you can’t just magic them up to the right point), colonial repression, religious conflict, massive local corruption, language barriers and the much bigger barriers of disease (still a major problem in Africa deep into twentieth century), and so on. However where we stand *now*, when much (not all) of this has finally gone away, you can understand the position of the Indian Energy minister who has declared that he’s going for coal in a big way. India can now afford it, coal technology now removes emmitants (bar CO2 of course), you can run a major grid reliably off it, etc. etc. And he has lots. It will give his poor the major benefits we take for granted. Meanwhile in the advanced West, we are still struggling after decades to make renewables a reliable and sizable fraction of our energy, even when paying well over the odds for its output. And ironically, if output does grow much more, we haven’t got the smart grids good enough to balance it, and anyhow still need fossil energy to back its low points (in most countries). There’s only so much water Norway and Sweden can pump uphill to level things out, and several countries are already using their capability. Matt Ridley has some good info on these topics. If we can’t do it yet, how could India? Why would they risk it? I agree that climate4you is as good a collection of information as is available. These articles cover some of the territory of which temperature zones actually are important to monitor. Next is the compound nature of warming. If near surface temperature increases and the increase causes surface evaporation then the temperature will decrease but the total amount of energy is the same as the elevated level even though the temperature is lower. The atmospheric energy level is the sum of all of the components. So temperature is not the sole indicator of global warming. As moisture level in surface air increases, with moist air being lighter than dry air, the moist air will begin to rise. This imparts kinetic energy to the air mass, so now the total energy is the sum of the temperature plus the latent heat energy of the water plus the kinetic energy in the moving air. And the degree of warming is the difference between all of those present factors compared to say 200 years earlier. Conclusion: your temperature observations are too simplistic to make any meaningful analysis possible. I am sorry that you feel offended by the guile word play. Indeed you do deal evenly with commenters with patience and consideration. That is both noted and appreciated. On the other hand I am affronted by the theme that says CSD’s are rational thinking people while (climate) scientists are scheming profit driven manipulators preying on a gullible public with a warmist fear campaign. This is not your claim specifically, but the warmist meme theme feeds into that thinking. If I set about denegrating you efforts here I would have been unambiguously acerbic, more along the lines of what is dished out to me commenting at Jo Nova (only with some wit), but that was not my intention at all. To understand Africa and poverty (and even Libertarianism) one needs to look to the work of Robert Sapolsky and specifically toward the end of his field research in Africa. Without that understanding “addressing poverty” becomes an endless cycle of political opportunism of one sort or another. I would love to continue here but I have things to do. The temperature stuff started with you challenging minimal warming (i.e. per simple GST) over the last 18 years. The fact that GST may or may not be a poor proxy for the wider concept of ‘Gloabl Warming’, inclusive of all its claimed characteristics, doesn’t validate that challenge. Added to which it does not seem plausible that if there was enough extra energy in the system to be globally dangerous, this wouldn’t show as a significant uptick in GST. So it may not be a *subtle* proxy for GW, but it is still okay for indicating *dangerous* GW (*if* of course one can also subtract natural variation successfully – even the orthodox don’t claim this is insignificant). The Clive Best article is familiar. I think I read this a long while back. The rise in height where IR radiates out to space is standard ground. And afaics, the article supports the skeptic position much more than the orthodox one (I guess not a surprise since we know he’s a skeptic). In addition to a criticism of IPCC assumptions, in the second half Best points to the key topic of feed-backs (for instance clouds, which models still can’t deal with). The net sign and size of all these feed-backs, which determines the overall climate sensitivity, is what the entire debate about GW hinged on then as now, and indeed since the beginning. The IPCC claims feed-backs are +ve and large. Regarding your thoughts on moisture, the total column water vapor graph at climate4you is interesting, as is the associated text. If anything atmospheric water vapor appears to have reduced slightly in the last 30 years, but of course like pretty much everything else in the climate domain this is a much debated area, especially since water vapor links to clouds again. In summary there is plenty of uncertainty; which is the window via which social mechanisms crept in. I concentrate on these, not on the climate system itself. Your use of ‘guile’ is not ‘wordplay’. It has a very specific meaning, which you have not modified via a humorous or any other major contrasting context. Your poor treatment elsewhere does not license you to act in bad faith; how could this behavior cause anything but an escalation to the tribalism you dislike? You still have the opportunity to show good faith, and correct that comment. I’ve not read Robert Sapolsky’s work, though I’ve stumbled across him a couple of times. He seems to make the point that poverty causes immense stress on people. And that poverty is an entrenched ‘whole environment’ problem, i.e. including the culture engendered by (long-term) poverty. Folks have not the will to rise above it or strive for change always. Well these concepts (if I have them right) are not only highly plausible, they fit well with the concept of gene-culture co-evolution (we are primed for cultural alignment) and Michael Gazzaniger’s ‘social mind’ (both mentioned at posts here sometimes). People’s character and identity are a much deeper function of the culture they’re embedded in than is generally realized. Erasing poverty means changing the culture as well as changing the physical causes, which takes much time. But this seems like very strong evidence *for* mass grid electricity, which engenders better hospitals and hygiene (e.g. fridges), leveled temperature / comfort (heating and a/c), and clean indoor air (one of the big killers of the poor is early death from smoke due to indoor cooking fires, about 4 million a year I think Matt Ridley quotes). Not to mention all the leisure devices we take for granted, like TV, which helps with positive cultural change. These are game changers for a ‘whole environment’ improvement that most of the West experienced long ago.